That safety verdict should now be re-examined in the light of hundreds of once-secret WWII documents obtained by Griffiths and Bryson – including declassified papers of the Manhattan Project, the U.S. military group that built the atomic bomb. Fluoride was the key chemical in atomic bomb production, according to the documents. Massive quantities of fluoride – millions of tons – were essential for the manufacture of bomb-grade uranium and plutonium for nuclear weapons throughout the Cold War. One of the most toxic chemicals known, fluoride rapidly emerged as the leading chemical health hazard of the U.S atomic bomb program–both for workers and for nearby communities, the documents reveal. Much of the original proof that fluoride is safe for humans in low doses was generated by A-bomb program scientists, who had been secretly ordered to provide “evidence useful in litigation” against defense contractors for fluoride injury to citizens. The first lawsuits against the U.S. A-bomb program were not over radiation, but over fluoride damage, the documents show. Human studies were required. Bomb program researchers played a leading role in the design and implementation of the most extensive U.S. study of the health effects of fluoridating public drinking water–conducted in Newburgh, New York from 1945 to 1956. Then, in a classified operation code-named “Program F,” they secretly gathered and analyzed blood and tissue samples from Newburgh citizens, with the cooperation of State Health Department personnel. The original secret version–obtained by these reporters–of a 1948 study published by Program F scientists in the Journal of the American Dental Association shows that evidence of adverse health effects from fluoride was censored by the U.S. Atomic Energy Commission (AEC) – considered the most powerful of Cold War agencies – for reasons of national security. The bomb program’s fluoride safety studies were conducted at the University of Rochester, site of one of the most notorious human radiation experiments of the Cold War, in which unsuspecting hospital patients were injected with toxic doses of radioactive plutonium. The fluoride studies were conducted with the same ethical mind-set, in which “national security” was paramount. The U.S. government’s conflict of interest–and its motive to prove fluoride “safe” – has not until now been made clear to the general public in the furious debate over water fluoridation since the 1950’s, nor to civilian researchers and health professionals, or journalists. Less-known to the public is that fluoride also accumulates in bones – “The teeth are windows to what’s happening in the bones,” explains Paul Connett, Professor of Chemistry at St. Lawrence University (N.Y.). In recent years, pediatric bone specialists have expressed alarm about an increase in stress fractures among U.S. young people. Connett and other scientists are concerned that fluoride – linked to bone damage by studies since the 1930’s – may be a contributing factor. 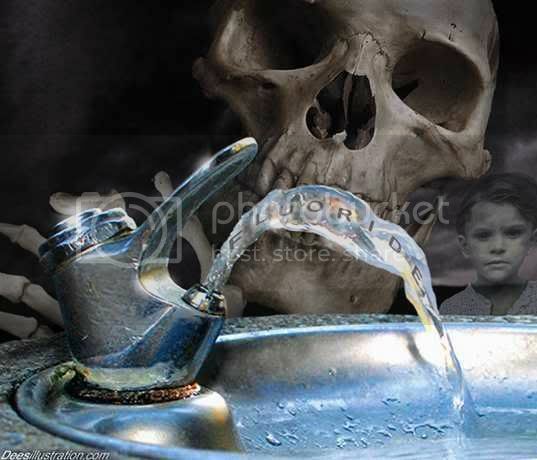 The declassified documents add urgency: much of the original proof that low-dose fluoride is safe for children’s bones came from U.S. bomb program scientists, according to this investigation. After reviewing the memos, Mullenix declared herself “flabbergasted.” She went on, “How could I be told by NIH that fluoride has no central nervous system effects when these documents were sitting there all the time?” She reasons that the Manhattan Project did do fluoride CNS studies – “that kind of warning, that fluoride workers might be a danger to the bomb program by improperly performing their duties–I can’t imagine that would be ignored” – but that the results were buried because they might create a difficult legal and public relations problem for the government. The farms downwind in Gloucester and Salem counties were famous for their high-quality produce – their peaches went directly to the Waldorf Astoria Hotel in New York. Their tomatoes were bought up by Campbell’s Soup. The New Jersey farmers waited until the war was over, then sued du Pont and the Manhattan Project for fluoride damage – reportedly the first lawsuits against the U.S. A-bomb program. There was no embargo. Instead, new tests for fluoride in the New Jersey area would be conducted – not by the Department of Agriculture – but by the U.S. Army’s Chemical Warfare Service because “work done by the Chemical Warfare Service would carry the greatest weight as evidence if… lawsuits are started by the complainants.” The memo was signed by General Groves. Meanwhile, the public relations problem remained unresolved – local citizens were in a panic about fluoride. The New Jersey farmers’ lawsuits were ultimately stymied by the government’s refusal to reveal the key piece of information that would have settled the case – how much fluoride du Pont had vented into the atmosphere during the war. “Disclosure… would be injurious to the military security of the United States,” wrote Manhattan Project Major C.A Taney, Jr. The farmers were pacified with token financial settlements, according to interviews with descendants still living in the area. But this marriage of military secrecy and medical science bore deformed offspring. The University of Rochester’s classified fluoride studies – code- named Program F – were conducted at its Atomic Energy Project (AEP), a top-secret facility funded by the AEC and housed in Strong Memorial Hospital. It was there that one of the most notorious human radiation experiments of the Cold War took place, in which unsuspecting hospital patients were injected with toxic doses of radioactive plutonium. Revelation of this experiment in a Pulitzer prize-winning account by Eileen Wellsome led to a 1995 U.S. Presidential investigation, and a multimillion-dollar cash settlement for victims. The potential conflict of interest is clear. If lower dose ranges were found, hazardous by Program F, it might have opened the bomb program and its contractors to lawsuits for injury to human health, as well as public outcry. Unfortunately, much of the proof of fluoride’s safety rests on the work performed by Program F Scientists at the University of Rochester. 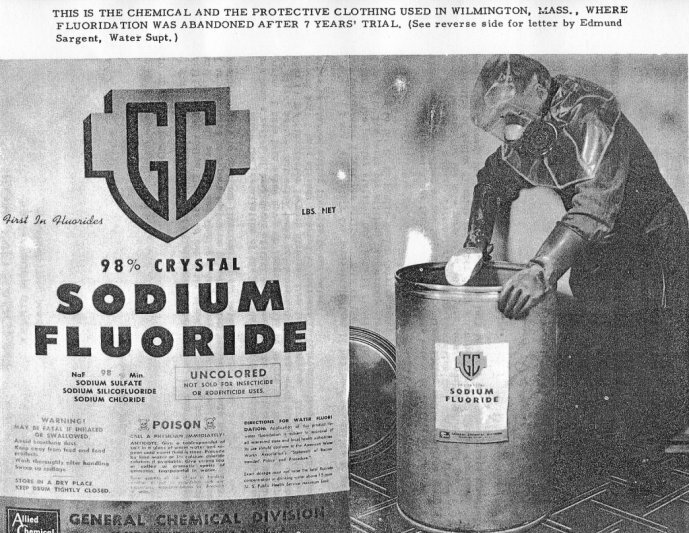 During the postwar period that university emerged as the leading academic center for establishing the safety of fluoride, as well as its effectiveness in reducing tooth decay, according to Dental School spokesperson William H. Bowen, MD. The key figure in this research, Bowen said, was Harold C. Hodge – who also became a leading national proponent of fluoridating public drinking water. Program F’s interest in water fluoridation was not just ‘to counteract the local fear of fluoride on the part of residents,’ as Hodge had earlier written. The bomb program needed human studies, as they had needed human studies for plutonium, and adding fluoride to public water supplies provided one opportunity. Bomb-program scientists played a prominent – if unpublicized – role in the nation’s first-planned water fluoridation experiment, in Newburgh, New York. The Newburgh Demonstration Project is considered the most extensive study of the health effects of fluoridation, supplying much of the evidence that low doses are safe for children’s bones, and good for their teeth. The committee recommended that Newburgh be fluoridated. It also selected the types of medical studies to be done, and “provided expert guidance” for the duration of the experiment. The key question to be answered was: “Are there any cumulative effects – beneficial or otherwise, on tissues and organs other than the teeth – of long-continued ingestion of such small concentrations…?” According to the declassified documents, this was also key information sought by the bomb program, which would require long-continued exposure of workers and communities to fluoride throughout the Cold War. The final report of the Newburgh Demonstration Project, published in 1956 in the Journal of the American Dental Association, concluded that “small concentrations” of fluoride were safe for U.S.citizens. The biological proof – “based on work performed … at the University of Rochester Atomic Energy Project” – was delivered by Dr. Hodge. When told that the reporters had several documents that directly tied the Manhattan Project’s successor agency at the University of Rochester, the AEP, to the Newburgh experiment, the DOE spokesperson later conceded her study was confined to “the available universe” of documents. Two days later spokesperson Jayne Brady faxed a statement for clarification: “My search only involved the documents that we collected as part of our human radiation experiments project – fluoride was not part of our research effort. The secret version reports that most of the men had no teeth left. The published version reports only that the men had fewer cavities. The secret version says the men had to wear rubber boots because the fluoride fumes disintegrated the nails in their shoes. The published version does not mention this. 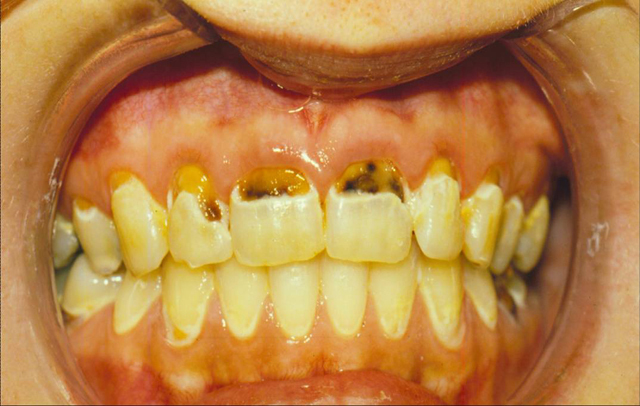 The secret version says the fluoride may have acted similarly on the men’s teeth, contributing to their toothlessness. The published version omits this statement. Joel Griffiths is a medical writer in New York City, author of a book on radiation hazards and numerous articles for medical and popular publications. Chris Bryson holds a Masters degree from the Columbia University Graduate School of Journalism, and has worked for the British Broadcasting Corporation, The Manchester Guardian.